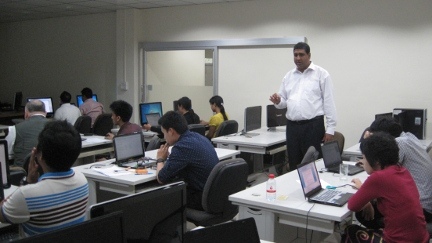 The Geoinformatics Center (GIC), attached to the Asian Institute of Technology (AIT) based in Thailand, invited the Sahana Software Foundation to conduct a 2 day SahanaCamp. The Sahana component of the awareness and capacity building workshop was part of a 3 week long course the Asian participants underwent at the AIT. The SahanaCamp took place on December 16 and 17, 2014, at the GIC premises in AIT. The Japanese Aerospace Exploration Agency (JAXA) Sentinel Asia initiative is collaborating with AIT with assisting Asian countries with disaster management efforts. One aspect is providing satellite imagery for hazard mapping for pre-disaster activities. Another is, following a disaster, JAXA provides a set of maps of the damage to AIT, who intern supply them to the affected country’s respective Government agency. 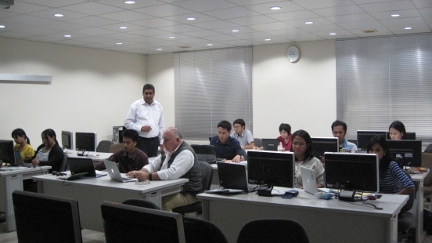 The workshop attendees at AIT were receiving disaster preparedness training on the use of GIS for National Hazard Mapping. On day one, the SahanaCamp complemented those activities by introducing them to the Community Resilience Mapping and Vulnerability Mapping tools with hands-on exercises that helped them realize how additional GIS layers such as census data and assets (e.g. buildings) data can be overstayed with the hazard maps to determine the communities level of risk. The second day of the SahanaCamp exposed them to Sahana-based alerting/warning (i.e. Sahana CAP-enabled Alerting and Messaging Broker) and situational-reporting (i.e. Sahana Incident Reporting System) tools. The objective was to introduce need for hazard maps to define alerting boundaries that are different from political or national administrative boundaries. For example, if we are aware of the flood planes then when issuing a flood warning to that area one would ensure the warning is targeted to populations in and closely around that vulnerable area; opposed to issuing a province-wide or district-wide alert. The exposure to the Sahana software tools and related exercises were followed by with the participants analysing the strengths, weaknesses, opportunities, and threats of the various Sahana tools and the value of Sahana community of practice.There was a confusion among participants that Sahana Software Foundation would provide free services which it does during a crisis. They realized that they would need to build local capacity such as some software development capabilities. They do foresee opportunities and strengths that emerge from the Open Source Software and the diverse Community associated with the Software. The participants planned action to further explore the Sahana software and make efforts to introduce it to their organizations for further evaluation. The participants are affiliated with to various government institutions in Bangladesh, Indonesia, Myanmar, Philippines, Sri Lanka, and Thailand. They are specifically associated with the JAXA Mini Projects for Sentinel Asia and SAFE.